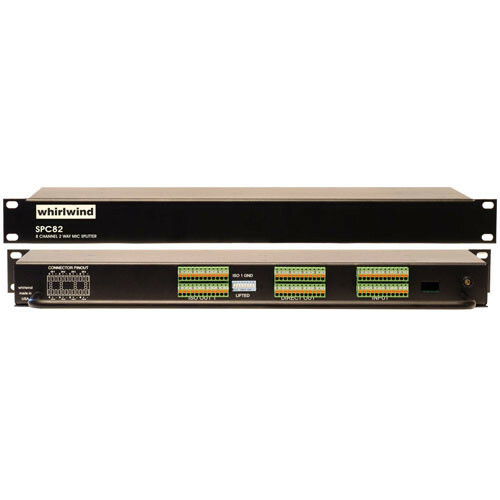 The SPC82PJT from Whirlwind is a passive, rack mountable mic splitter designed for installed applications. The sleek, 1RU unit allows you to input eight mic channels and provides both direct and transformer-isolated outputs for each channel. The unit uses high-quality Jensen transformers for clear, precise audio. All I/O connections are made via removable Phoenix-style connectors for making balanced connections. The splitter's outputs will not pass phantom power, so rear terminal connections are provided for the optional DCSP1 external phantom power supply. A series of ground-lift DIP-switches is provided on the back panel for eliminating hum caused by ground loops. Note: If your application requires phantom power, the DCSP1 must be purchased separately to supply phantom power to the unit. Box Dimensions (LxWxH) 22.0 x 10.0 x 5.0"